This is a quick little cards done using the Moroccan Designer Series Paper. 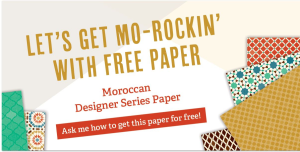 Now remember, here in October the regular Designer Series paper is Buy 3, Get 1 Free. You might want to take advantage of that special! Mark your calendars for Jan 21st for the Winter Camp Stamp-in-Oga 2017!